Hi guys, I'm back with another Halloween trio from Static Lacquer. This trio is inspired by the wonderful 1993 movie Hocus Pocus featuring Bette Midler, Kathy Najimy, and Sarah Jessica Parker as witch sisters. I mean, you've all seen it, so I don't need to give any more of a synopsis. If you haven't seen it, you need to. This trio will be available on Friday, Sept. 28th at 8 AM PST in both the Static Lacquer and Polish Nook websites for $11 each or as a trio for $30 + shipping. Don't forget, if you get them from the Polish Nook, you can add the Munsters trio to your cart as well. This set features jelly finishes with UCC and holo flakes. Shall we go ahead and get a closer look? Up first we have Mary (played by Najimy) in what appears to be inspired by her very fall-like outfit. The polish is a gold-leaning orange jelly base with silver holo flakes and green to gold UCC flakes. Up next we have the sister Sarah (played by Sarah Jessica Parker) which is inspired by her cloak/dress. It's a medium purple jelly base with silver holo flakes and pink to copper UCC flakes. The last sister portrayed is Winifred played by Bette Midler. The polish matches her cloak/dress as well, and is a yellow-based green jelly base with silver holo flakes, and purple to gold UCC flakes. These all applied the same, so what I say here goes for all of them. The first coat goes on sheer, but it builds up to full opacity with the third. Since these are jellies, the sheerness is to be expected. Any visible nail line you may see in my photos is due to my bright blogging lights and you can't see it in real life. The formula was a breeze to work with, and it dried with little texture and a slightly satin finish. I found they looked best with a coat of topcoat, but queenofnails83 also shows how beautiful they are with a matte topcoat. If I'm pressed for a favorite, I'd have to say Mary because that orange is very unusual and screams fall to me. Again, you can get these at either the Polish Nook or the Static Lacquer website. 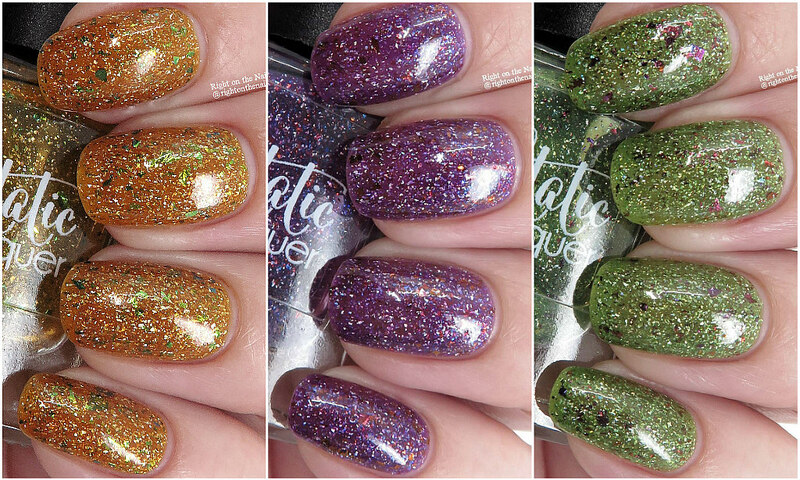 If you are getting any of the Munsters trio polishes, you'll need to head over to the Polish Nook. You don't have much time to wait because they will be available this Friday at 8 AM PST for $11 each or $30 + shipping for all 3. You can learn more about Static Lacquer on their website, Facebook, Group, and Instagram pages.